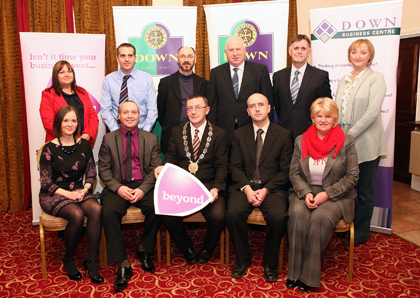 THE Beyond business programme for Down District has hosted a Christmas networking event for local businesses. The continued successful support to the business community by the Beyond programme was mirrored in the solid turnout by local business people at the Millbrook Lodge Hotel in Ballynahinch (Thursday 13 December). Pictured at the Beyond Christmas event are guest speakers from three local businesses -Sinead McGarrigle, Michael McKervey, Ciaran Clancy – with Down District Councillors including Cllr Mickey Coogan, Down District Council Chairman, Invest NI Southern Regional Manager, Mark Bleakney, Janice Symington, Down Business Centre and Beyond Programme staff. The Christmas event provided the opportunity for local businesses and elected representatives to come together in an informal setting and connect. Amongst those attending the Beyond business event was Down District Council Chairperson, Councillor Mickey Coogan, who welcomed local companies and elected representatives to the event and said: “The Beyond business support programme has been successfully providing a very high standard of tailored support to existing businesses in the Down District area. “It has been creating and facilitating opportunities for local businesses to help raise their profile and discussing key issues affecting them has been a core element of the programme. Pictured at the Beyond Christmas event are guest speakers from three local businesses -Sinead McGarrigle, Michael McKervey, Ciaran Clancy – with Down District Councillors including Cllr Mickey Coogan, Down District Council Chairman, Invest NI Southern Regional Manager, Mark Bleakney, Janice Symington, Down Business Centre Manager and Beyond Programme staff. The Beyond programme has a strong network of over 410 individuals signed up to its website from over 350 businesses and a valuable network of experienced business mentors through its business mentoring programme.